In this edition of “Striking the Right Balance,” Maxime Maheu and his colleagues at the University of Montreal and the Montreal Geriatric University Institute summarize the current knowledge and offer important insight on the role of hearing in postural control. If you would like to be more involved in all things vestibular, please sign-up for the Vestibular Special Interest Group. Sign-up by simply emailing ericazaia@hotmail.com to let us know you want to be a part. Also, check out our Facebook page for a free list of online vestibular resources at the CAA National Vestibular Special Interest Group page. Winter is already at our door and you are probably dreaming of your last vacation where you were standing on a beach staring at the ocean. While standing on the warm sand, you probably did not notice all the sensory information necessary to prevent you from falling. Indeed, upright posture requires integration of somatosensory/proprioceptive, visual and vestibular information. Depending on the environment, a different weight could be attributed to different sensory information.1,2 Over the past few years, research has proposed new evidence revealing the possible contribution of other senses, such as hearing, in postural control. Ultimately, research aims at understanding how hearing could help us maintain balance. However, so far, there is no consensus on the subject. Understanding how auditory information may help improve balance could lead to new targeted interventions in vestibular rehabilitation and falls prevention programs. This is specially of interest for audiologists who encounter patients with hearing loss and balance issues in their daily practice. Therefore, the objective of this article is to discuss recent evidence suggesting how hearing may influence postural control. There is evidence that the presence of sound in the environment may affect (positively or negatively) one’s ability to maintain balance.3–8 However, very few studies have investigated the influence of reduced auditory cues on balance in normal hearing listeners, which is fundamental to the understanding of the role of hearing on posture. One of the first investigations on the effect of the reduced auditory cues in normal hearing individuals and its influence on balance was reported by Kanegaonkar et al.9 They assessed postural control in normal hearing participants in different auditory conditions (soundproof room; regular room; with and without hearing protectors). They found significantly greater sway when participants were standing with eyes open in a soundproof room rather than in a regular room. They also found significantly greater sway with participants standing with their eyes open with hearing protectors as opposed to when no hearing protectors were used. This observation was supported later by the observations by Vitkovic et al.10 This group reported a significant decrease in balance in the absence of auditory cues in healthy controls. These studies indicated that auditory cues may contribute to balance in normal listeners, but the methodology did not allow to assess the underlying sensory weighting strategies. More recently, a study from our group aimed at understanding how auditory cues in normal hearing participants may influence sensory weighting strategies.11 We recruited 14 normal hearing healthy participants with normal vestibular function as confirmed by the results of video head impulse (vHIT), cervical vestibular evoked myogenic potential (cVEMP) and ocular vestibular evoked myogenic potential (oVEMP). Participants had to complete the modified clinical test sensory integration in balance (mCTSIB), which consists of 4 postural conditions: (A) eyes open on firm surface, (B) eyes closed on firm surface, (C) eyes open on foam, and (D) eyes closed on foam (Figure 1). Our results suggest that auditory input plays a significant role in postural control, supporting previous literature. Our study goes further by suggesting that reduction of auditory cues in healthy adults increases reliance on visual cues (Figure 2). Therefore, it is possible to hypothesize that, when auditory cues are disrupted in normal listeners, the weight accorded to auditory input during postural control tasks is redistributed and used to increase the dependence on visual cues. Considering the evidence that a temporary reduction in auditory cues in normal hearing individuals may influence balance, one can wonder how congenital sensorineural hearing loss would influence balance. Previous evidence suggests that postural control is significantly reduced in hearing-impaired individuals, more specifically for conditions where somatosensory or visual cues were reduced or absent.12–14 This may suggest a sensory reweighting in hearing-impaired individuals, which could be detrimental to postural control. However, one major issue with most of the previous studies is the absence of vestibular function tests. It has been previously demonstrated that up to 70% of the participants with congenital hearing loss may have a vestibular impairment,13 which could become an important confounding factor. Therefore, it is still not possible to isolate the influence of hearing loss on postural control. A study from our group aimed at evaluating the influence of congenital hearing impairment on sensory weighting during postural control tasks.15 We recruited 14 normal healthy controls and 14 congenitally hearing-impaired participants. All controls had normal vestibular function. However, 10 out of 14 hearing-impaired participants had at least one abnormal vestibular test. Cervical VEMP (cVEMP) was bilaterally absent in 54% and unilaterally in 7%; oVEMP was bilaterally absent in 64%, and vHIT gain was bilaterally reduced in 43% of the individuals. All participants were assessed using the mCTSIB protocol without auditory input (hearing impaired without hearing aids, controls with double hearing protection). The results confirmed poorer postural stability in hearing-impaired group (with and without vestibular loss). 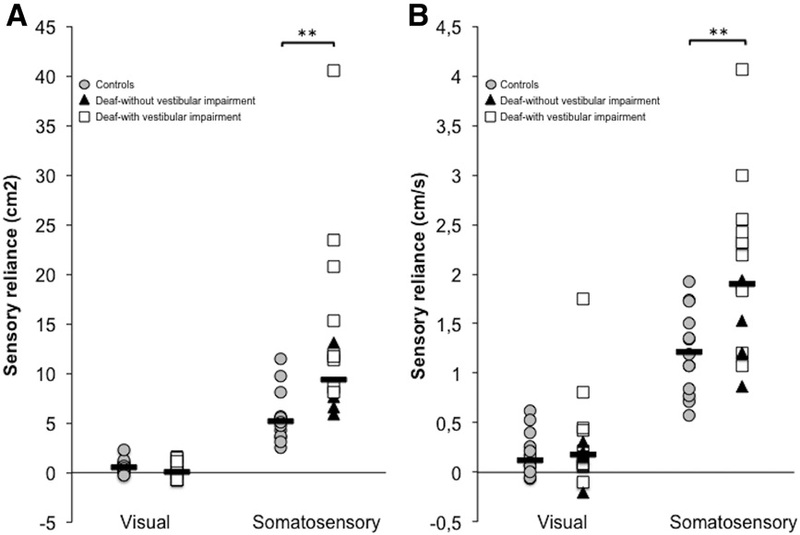 More importantly, data suggested that congenitally hearing-impaired individuals rely more on somatosensory information for postural control than normal hearing controls (Figure 3). This increased somatosensory reliance may increase postural sway when it comes to more challenging postural conditions. When looking more closely at the results, we can see a trend towards higher somatosensory dependence in hearing-impaired individuals with vestibular loss. However, the small number of hearing-impaired participants without vestibular loss does not allow us to draw definitive conclusions. It is, however, possible that the effect observed in hearing-impaired individuals may be enhanced by the large proportion of participants with vestibular impairment. Considering that a strong relationship exists between an increased risk of falls and decreased auditory ability,16,17 auditory amplification through hearing aids may be an effective falls preventative tool. Previous studies have investigated the relationship between hearing aids and postural control. In a study by Rumalla et al,18 postural control abilities of 14 hearing-impaired participants were assessed with and without hearing aids. Their results suggested that hearing aids were useful to improve postural control. Rumalla’s et al. study was recently supported by Negahban et al,19 study. On the other hand, McDaniel et al,20 failed to demonstrate a significant benefit of hearing aids on posture. This discrepancy between the studies may be explained by the absence of prior vestibular testing. Unfortunately, none of these studies tested for vestibular function, which limits the results interpretation. Thus far, only one study attempted to classify hearing-impaired participants based on their vestibular function. Vitkovic et al,10 suggested that patients with greater vestibular deficits derived greater postural benefits from their hearing aids. However, the authors did not match hearing thresholds between the groups (hearing impaired and vestibular impaired). Their results suggested a significantly greater influence of hearing aids in the vestibular impaired group, which was the group with better hearing thresholds. Therefore, the specific influence of vestibular loss in postural stability in hearing-impaired individuals wearing hearing aids remains unknown. Based on that, our group recently studied postural control in 14 normal healthy controls and 18 hearing-impaired individuals, 10 of which with hearing and vestibular loss (HIVL) and 8 with matched hearing loss only (HI). These participants performed the mCTSIB in 2 different auditory conditions (with and without hearing aids) in random order. The results support previous findings suggesting greater postural sway in the hearing-impaired group. However, our results add to the previous studies by suggesting that the benefit of hearing aids may be linked to vestibular function. In fact, only those with both hearing and vestibular impairment demonstrated a significantly greater benefit from auditory cues as opposed to controls and hearing-impaired only group. Interestingly, no significant difference was observed between the hearing-impaired only group and control group.21 It is possible that the reduction of somatosensory dependence observed in HIVL group when standing with hearing aids may explain the improved stability within this group. The studies discussed above provide evidence that auditory input plays a role in postural control. Several hypotheses have been suggested to understand how auditory cues may influence balance. One mainstream hypothesis is that it provides auditory landmarks.5,6,22 This hypothesis proposes that one could position themselves by the spatial representation provided by auditory input. Moreover, the studies from our group highlight that auditory cues may modulate the weight accorded to other sensory information and this could help decrease maladaptive sensory reweighting in case of vestibular loss. This opens new possibilities when it comes to fall prevention and rehabilitation. A few studies have investigated the use of auditory cues in vestibular rehabilitation23 and in elderly.24 However, several questions still remain, and further research is needed to better understand and optimize the role of hearing aids in balance. As audiologists, this is of major importance in falls prevention. It becomes more important to identify patients with concomitant HIVL and discuss the potential benefit of hearing aids use not only for communication, but also for patient safety. Peterka RJ. Sensorimotor integration in human postural control. J Neurophysiol 2002;88:1097–18. Assländer L, Peterka RJ. Sensory reweighting dynamics in postural control. J Neurophysiol 2014;111:1852–64. Easton RD, Greene AJ, DiZio P, et al. Auditory cues for orientation and postural control in sighted and congenitally blind people. Exp Brain Res 1998;118:541–50. Gandemer L, Parseihian G, Kronland-Martinet R, et al. The influence of horizontally rotating sound on standing balance. Exp Brain Res 2014;232:3813–20. Pagnacco G, Carrick FR, Wright CHG, Oggero E. Between-subjects differences of within-subject variability in repeated balance measures: consequences on the minimum detectable change. Gait Posture 2015;41(1):136–40. Raper SA, Soames RW. 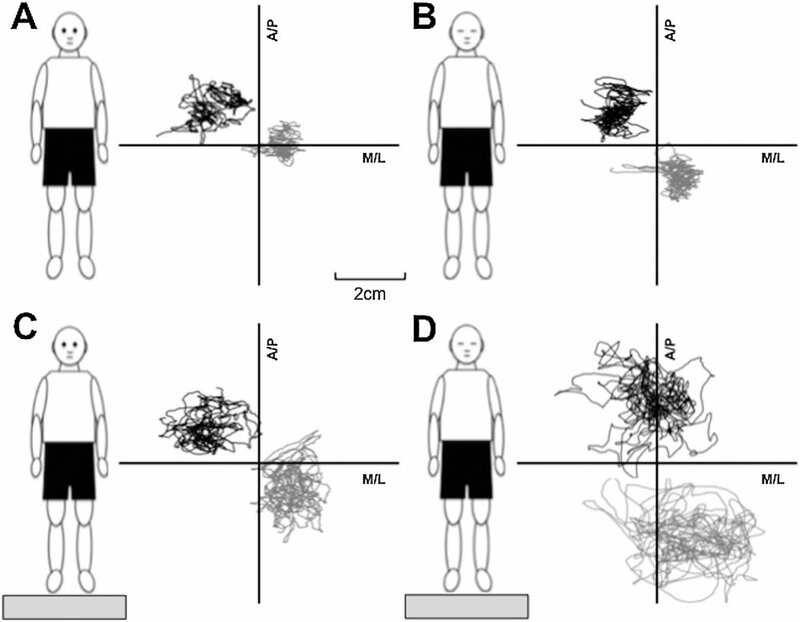 The influence of stationary auditory fields on postural sway behaviour in man. Eur J Appl Physiol 1991;63:363–67. Kanegaonkar RG, Amin K, Clarke M. The contribution of hearing to normal balance. J Laryngol Otol 2012;126:984–88. Vitkovic J, Le C, Lee SL, et al. The contribution of hearing and hearing loss to balance control. Audiol Neurootol 2016;21:195–202. Maheu M, Sharp A, Landry SP, et al. Sensory reweighting after loss of auditory cues in healthy adults. Gait Posture 2017;53:151–54. doi: 10.1016/j.gaitpost.2017.01.015. Suarez H, Angeli S, Suarez A, et al. Balance sensory organization in children with profound hearing loss and cochlear implants. Int J Pediatr Otorhinolaryngol 2007;71:629–37. De Sousa AM, de França Barros J, de Sousa Neto BM. Postural control in children with typical development and children with profound hearing loss. Int J Gen Med 2012;5:433–49 doi: 10.2147/IJGM.S28693. Maheu M, Sharp A, Pagé S, Champoux F. Congenital deafness alters sensory weighting for postural control. Ear Hear 2017;38:767–70. doi: 10.1097/AUD.0000000000000449. Lin FR, Ferrucci L. Hearing loss and falls among older adults in the United States. Arch Intern Med 2012;172:369–71. Agmon M, Lavie L, Doumas M. The association between hearing loss, postural control, and mobility in older adults: a systematic review. J Am Acad Audiol 2017;28:575–88. doi: 10.3766/jaaa.16044. Rumalla K, Karim AM, Hullar TE. The effect of hearing aids on postural stability. Laryngoscope 2015;125:720–23. Negahban H, Bavarsad Cheshmeh Ali M, Nassadj G. Effects of hearing aids on static balance function in elderly with hearing loss. Gait Posture 2017;58:126–29. doi: 10.1016/j.gaitpost.2017.07.112. McDaniel DM, Motts SD, Neeley RA. Effects of bilateral hearing aid use on balance in experienced adult hearing aid users. Am J Audiol 2018;8:121–25. doi: 10.1044/2017_AJA-16-0071. Maheu M, Behtani L, Leroux T, et al. Vestibular function modulates the benefit of hearing aids in hearing impaired individuals during static postural control. Ear Hearing 2018; Submitted. Zhong X, Yost W. Relationship between postural stability and spatial hearing. J Am Acad 2013;24:782–88. doi: 10.3766/jaaa.24.9.3. Dozza M, Horak FB, Chiari L. Auditory biofeedback substitutes for loss of sensory information in maintaining stance. Exp Brain Res 2007;178:37–48. Ross JM, Will OJ, McGann Z, Balasubramaniam R. Auditory white noise reduces age-related fluctuations in balance. Neurosci Lett 2016;630:216–21. doi: 10.1016/j.neulet.2016.07.060. Maxime Maheu is a PhD candidate at University of Montreal and a clinical audiologist. Over the past few years, his research and clinical practice focused on vestibular evaluation. The main objective of his thesis is to assess vestibular function and postural control in hearing-impaired. Thus, he developed both a clinical and research expertise in vestibular and postural control assessment, which led him to become lecturer in vestibular sciences at Montreal and Ottawa University. MS Houde is with the School of Speech Language Pathology and Audiology, Université de Montréal, Quebec, Canada. L Behtani is with the School of Speech Language Pathology and Audiology, Université de Montréal, Quebec, Canada. M Nooristani is with the School of Speech Language Pathology and Audiology, Université de Montréal, Quebec, Canada. F Champoux is with the School of Speech Language Pathology and Audiology, Université de Montréal, Qc, Canada and the Research Centre of the Montreal Geriatric University Institute, Québec, Canada.